For many people, the change in seasons is highlighted by the shift in the closet that also brings self-consciousness to the forefront. Into storage goes the snug top or pants that never saw the light of day this summer—along with the hope that they’ll fit next year. As the long sleeves, chunky sweaters and puffy vests come out into the crisp air, they also act as a security blanket, covering the body’s flaws. It can be difficult to accept the inevitable changes aging brings, as reflected by the thriving diet, exercise and plastic surgery industries. Having options that challenge the aging process is great. But to feel truly satisfied, it is essential to find a balance between looking young and having emotionally healthy expectations for this next stage of life. 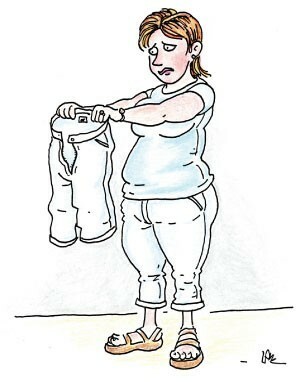 Keeping clothes that make you feel like a failure is the antithesis to emotional health. Instead of focusing on negative aspects of your body, now is the time to consider how strong it is, from enduring a round of golf to whipping up a dinner for friends or exploring a new city. During the course of 50 years of life, a body has usually lived through many remarkable experiences, with more still to come. It deserves to be treated with respect. Resist the urge to be self-critical. Instead, consider that your arms were strong enough to help win a tennis game. Challenge your body with new experiences and test out different styles of clothing, hair or accessories—a reminder that an imperfect body can still experience a full life. It is also important to choose not to spend time with those who criticize what others look like. Of course, it is healthy to make the most of a body and for some that means losing weight or having plastic surgery. However, in order to feel truly content, everyone must first love and accept themselves as a normally flawed human being. Ultimately, happiness always emanates from the inside, no matter how a person looks on the outside.